So, I have been getting faint positives since yesterday morning. I waited until today to take a digital because my hcg was too low to see the beautiful word "pregnant" yesterday. Awesome, huh? My IPs are thrilled beyond words and I am so happy for them. We have blood tests on 7/3 and 7/5 to determine my actual hcg numbers (beta tests) and then an ultrasound will be scheduled around 2 weeks after to determine if one or both girls hung around. Please pray for one girl as twins is not really ideal. They are really hoping for a singleton pregnancy and so am I. 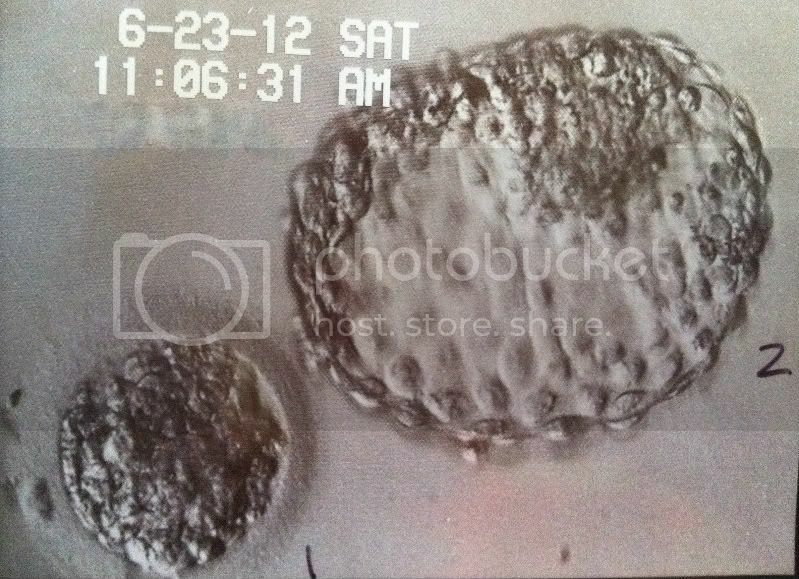 These are the 2 embryos that I am currently carrying for my wonderful IPs. #2 is a total over-achiever. I know most of you don't know anything about IVF but let me tell you, this particular embryo is spectacular. She looks a lot larger than her sister because she has advanced to the next stage of bursting out of her shell. #1 is a great embryo too but she hadn't broken out yet as of transfer this past Saturday. These girls are 6.5 day embryos which is fabulous. Most IVFers pray for 5 dayers because that is what is known as blast stage. If they can get to that point, they are usually very strong and healthy. My IPs couldn't have asked for better odds as these girls exceeded the 5 day mark and grew exponentially before transfer. Please pray for my IPs as I hope to be carrying at least one of these girls for the long haul. Hey guys, here's a quick update on my latest surrogacy journey. They are going to thaw the last 2 embryos that my IPs have today. Both are little girls and we hope that they make the thaw. It's all so nerve-wracking! Our transfer is set at 10am Pacific time so that is 1pm to all my southern friends/family. I would greatly appreciate it if you would please say a quick prayer for my IPs and the procedure. They want nothing more than to have a sibling for their daughter. I never got around to posting a photo of our house after it was completed. Our sod is coming in rather nicely. The back is a different story. It is seeded and taking forever to grow in. I miss having underground irrigation like we had in CO. I can't stand seeing the hoses and tripping over them is a pain. Maybe we will sod the back and put in a sprinkler system? I have no idea. We live on a corner lot at one of our neighborhood's entrances. Because of that, we have a rock wall and nice landscaping flanking our front corner and side of our house. I love it! I don't have any new pics to post but I do have some good news. Both of my boys are going to the championship game this weekend! Emerson's team will be playing the Red Sox (7-8 coach pitch league) in the morning and Hayden's team will be playing the Red Sox (9-10 kid pitch league) just before noon. I think it is weird that both boys are playing teams with the same name but what's even weirder is that there is a kid who plays on both Red Sox teams (you can play up an age bracket if you are good enough). Heck, now that I think about it, we have a kid on both of my boys' teams that does the same thing so he will be in both games also. Crazy. I hope we have a fun day of baseball on Saturday. I am kind of bummed that the season is almost over. My kids plan to play Fall ball so I guess we will return to the fields sometime after school starts. I look forward to it!